PLYT – the fun competitive board game that’s challenging for everyone and proven to improve maths. PLYT is for 2-6 players, aged 4+. See description below for more details about the game and how to play. The price shown includes V.A.T. and 2nd class post & packing within UK. PLYT is about challenging yourself to correctly combine a number of dice together within the time, thinking strategically and being the first to reach the top of PLYT mountain. What makes it unique is that players of all ages and abilities can compete against each other, everyone is challenged and everyone has the same chance of winning, so it’s perfect for family & friends or schools. So a young child adding 2 dice together can compete against a player who is just learning their 5 times tables and at the same time a player capable of multiplying up to 6 dice together. The key to winning is performing at your best and challenging yourself to the max. Answer correctly within the time and move round the board by the Master score – but beware – landing on a PLYT square can change the game! You can choose from a range of options to determine how competitive you want the game to be and how long it will last. There are also top tips to help improve maths and confidence with numbers. 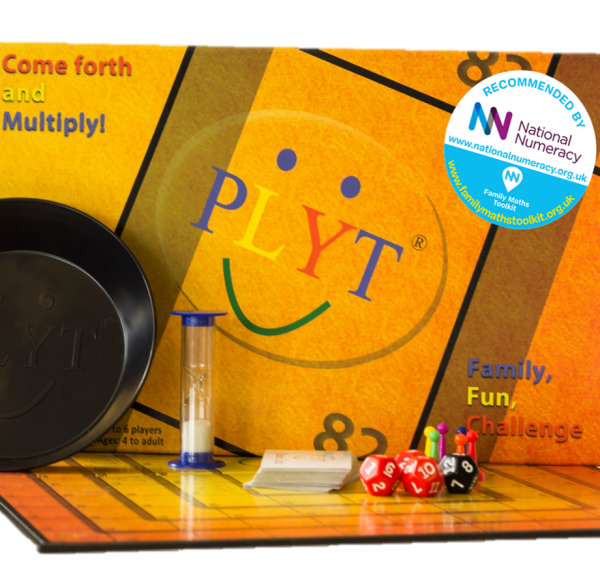 Unlike most maths based games that are aimed at a single level of ability, you’re never too old to PLYT and even better, we’re committed to providing more fun games that you can play with PLYT – check out our new game Sequence that you can play with the PLYT board and pieces. Love the different levels this game can be played at. We are a family of four and it is great the seven year old can access this and compete at his own level. A big hit with all the family. After reading the reviews we brought this to help our children—6 and 5—with their maths. Not only did it help them, though it also helped us—40 and 39! What is so good, is that it is so easy to play and that you can move the game away from the board to play a quick game if your filling ten minutes. While our 5 year old worked on identifying her numbers and then adding up to ten, our 6 year old worked on her 2 and 10x tables and we did long multiplication and division. My school intervention sessions are usually game-dominated, as I’ve found students learn best this way, and they get through a lot of essential examples without realising it. I find I make the games from pen and paper, or print something off, and the students do always enjoy it. However, there is something more enjoyable about a physical box and a proper board, which meant my students seemed to like it more. Admittedly, one student nearly threw the board out of the window from frustration and joked that he didn’t like this stupid game, but I’m pretty sure this was purely down to the fact he was losing! The lessons where I’ve played PLYT have been really fun, and my groups also found it hilarious coming up with phrases that ‘PLYT’ might stand for (head to the website to find out the real answer, which incredibly is not anything to do with poo). I asked my students to give me one thing they liked about the game, and one thing they would do to improve it. The comments were all very similar – most said that it was a great game for maths in a school setting and that it was helpful for learning their times tables, but they wouldn’t play it at home as a family. To be honest, the board and cards could very easily be used alongside trivia questions or other challenges to form your own maths or non-maths versions. Improvements were mainly on the design – they liked the pyramid idea but felt that the PLYT logo and cards could look more ‘fun’. I found that I agreed with their comments – the concept of the game is great. I especially liked how the games can be differentiated to suit different abilities, without being too obvious. My only improvement going forward would be the design – it does feel quite dated in some ways, but I would assume it would be very difficult and time-consuming to change the logo. However, if this was changed, I would be more tempted to buy it as a gift. I will definitely be using both the PLYT game and the Numbugz games for a long time to come. We played as family a few times to start so we could get a good feel of the game. Yet, once we got the hang of it we had adjusted the rules to match and got going fairly quickly. As a parent it was great to see the boys getting involved and I can see this becoming a great game to play even when we are on our Home Ed breaks. We really love playing Plyt. We love the fact we can all play together regardless of age or ability. I love the fact that both the children are learning at the same time as playing. The children love the fact that they can challenge themselves and they love competing with us. It has become our go to game! It doesn’t take hours to complete, isn’t complicated to understand and most of all, it is good family fun – and nothing gets better than that! The best numeracy game out there! We played this on Saturday afternoon just the girls and I and we had a great time….Ellie who is reluctant to sit and learn her times tables usually was learning without even realising…..On Saturday evening the girls asked to play again so we did as a family. Stu my fell got involved….He thought it was a great game too…..It got him using his brain and it will be a game we get out to play again and again…..On Sunday afternoon the girls got PLYT out again. They decided to play it themselves….They played a couple of games with no instruction from me which proves it is easy to pick up the rules….I can’t remember the last time my girls have been so keen to play a board game before…I would say it is well worth the money. 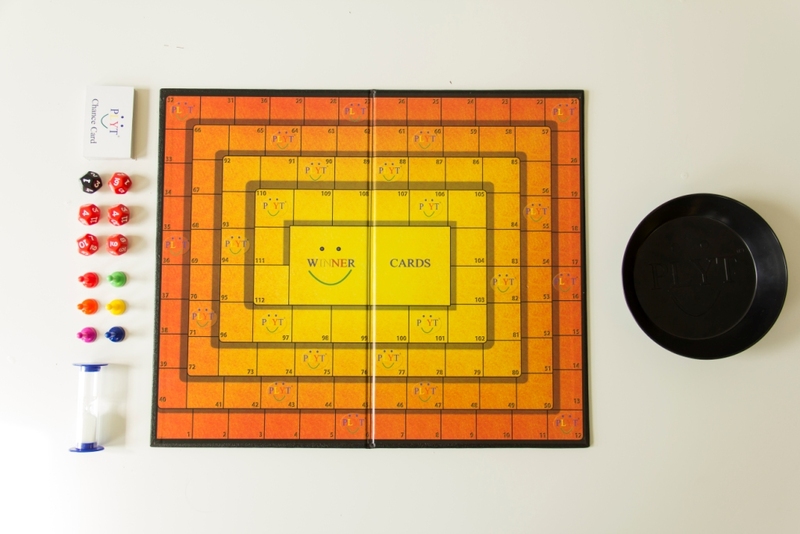 Played this with all ages – grandparents, kids etc and it’s good no matter what age. We were all playing a different game – Granny multiplying 2 dice, DD adding 3 dice, DS specific times tables with dice fixed and me & DH multiplying 3/4 dice. Worked well and we were all challenged. Amazing how quickly we all started to improve after playing only a short while. I was so pleasantly surprised that my daughter enjoys playing this game. It’s one of the only math activities that she plays joyously. We started out simple, basic multiplication, and then she said to me “can we make 12 the master die since I really need to work on my 12x tables”. Amazing to see how she realized it from the previous games and then really wanted to get better. Great option that beats flashcards and worksheets but it does require more adult effort to help and encourage. 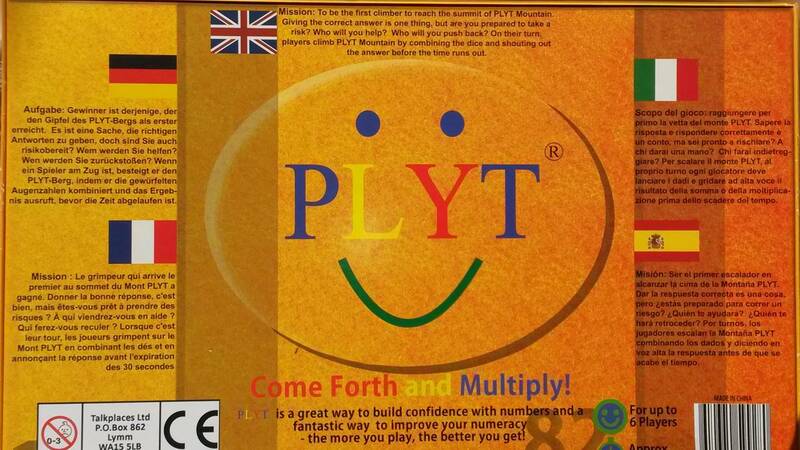 When I first came across PLYT Game, I had little clue as to how addictive and challenging this numeracy game would be. 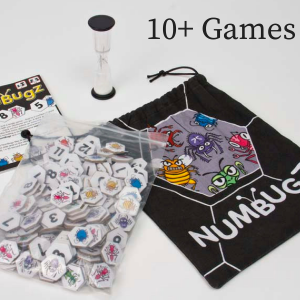 This is suitable for ages 4 and above and for 2 to 6 players. It is easy to play (when you set up all the rules), fun and competitive for all the family and it allows players of different ages and abilities to compete against each other with everyone being challenged. This game is a great game for everyone. The game comes with a play board, dice tray, 5 red dice, 1 black dice, 6 playing pieces, 32 chance cards, 30 second sand timer and instructions. The play board is made from hard cardboard. Each dice is 12 sided and the black dice is the master dice. 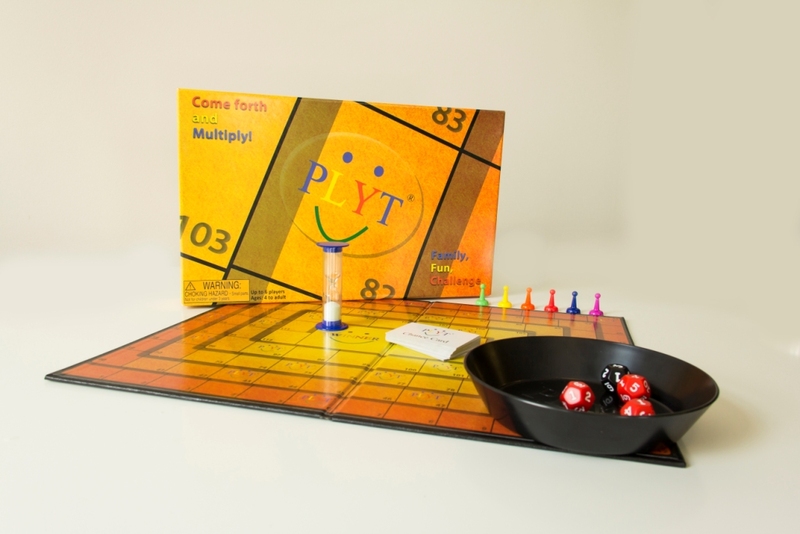 This game is about challenging yourself to correctly multiply a number of dice together within the time, thinking strategically and being the first to reach the top of PLYT Mountain. Before we start the game, we set the rules depending on our abilities. You can visit http://www.plyt.co.uk to discover other variations and tips on how to play. Mr C and I decided to make it harder for us by using three dice to start with whilst Mr K used two dice and Ms C used one dice and she had to multiply by a fixed number. This game is all about multiplying so it is useful to have a calculator handy to check the answers. If you answer correctly within the time, then move round the board by the Master score but beware that if you land on a PLYT square, it can change the game! Both of my children were very keen to land on the PLYT square, until they found a few nasty surprises in these chance cards as they are not always a helpful card! Overall this is a challenging and competitive game which is great to help children build their confidence and to improve their numeracy. Ms C answered incorrectly the first time round and when she next rolled the same number for the same question, she remembered the answer without much thinking and now in her mind, she remembers 2 multiplied by 8 is 16. I would definitely recommend this game. PLYT was definitely a surprise to us, as we had considered it would be too easy for our kids (and us). The ability to play at different difficulties at the same time will keep adults interested and less likely to pass when the kids ask to play an educational game. Plus they won’t be as intimidated knowing the adult will have as hard of a time at it as they will. And until ours can master the 5-dice variation, we’ll keep pushing them to practice! 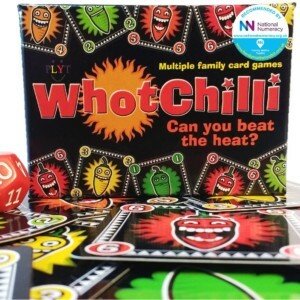 We love playing board games as a family and often spend a hour or so in the evenings playing games together but there is one problem with so many of our favorites… We have children aged 18 months to 13 and they obviously have different capabilities so choosing a fun and engaging game that is manageable but challenging for us all is practically impossible! The result is that we usually end up waiting until Bean is in bed, playing a quick and simple game with Beebs before bundling her into bed and trying to stay awake long enough to play something a little more taxing with the older girls. It’s not exactly ideal! •Nick and I tried (and failed) to multiply all 6 dice! The very best bit for me was that the instructions also say that you can challenge yourself to ‘move up a level’ by adding another dice. If you do this and get your sum correct you get 4 bonus point! All the children chose to try this and all succeeded! The boost to their confidence was amazing and they now ask to play every night so they can move up another level!! This game has won itself pride position on the living room shelves. It does not get put away with the other games because we have it out so much! 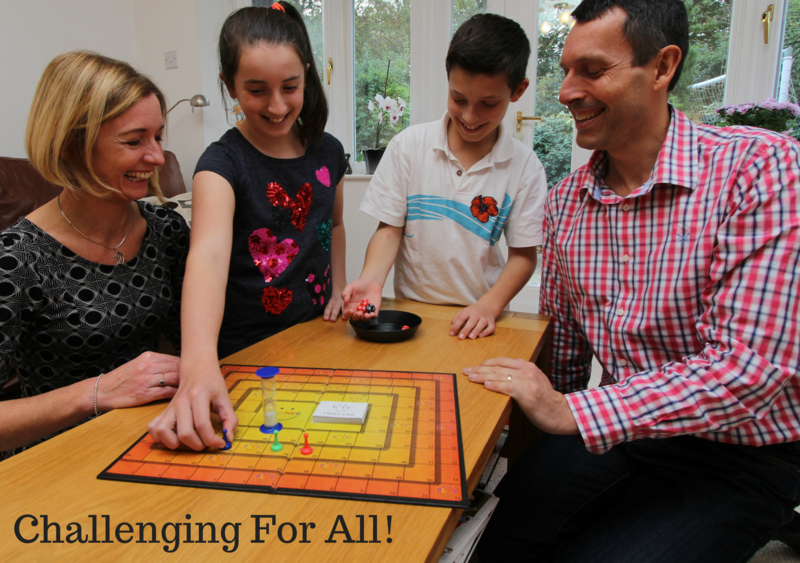 What better way to practice maths than as a family having fun!! If you are considering buying a board game this Christmas I really would encourage you to choose this one! There are no gimmicks, no flashing lights just a whole TON of learning fun!!! We’ve only had the game for a couple of weeks and we’ve already seen an improvement in my 6 years multiplication. What I like about it is its simplicity and also that you can effectively make up your own rules, so we simply state the two times table, use a single dice and the number rolled is the number you multiple with, which then in turn becomes the number you move on the board, which makes a quicker game, but we see this as a good thing with short attention spans, My 4 year old is also a keen player (joining forces with mummy). Its a game where you can effectively create your own rules, which means we can tailor our children’s learning to curriculum as he progresses. So, rather than multiplication, we can use two dice to create a sum, 12-6=6, move 6 etc etc. I think its simplicity in its design will make this product a success. I’ve been wanting a game like this for some time, getting kids to think about learning as fun (especially with learning by rote in schools) can be a challenge. All you need to do now is design a massive one so a whole class can use it? Don’t forget the app for IPAD, although the fact its a board game makes me like it more, its something the whole family can enjoy around the table. Thanks for this product. Delighted. I’ve been playing this game with children at the school where I teach and it’s been brilliant. So I wanted it at home for my children. 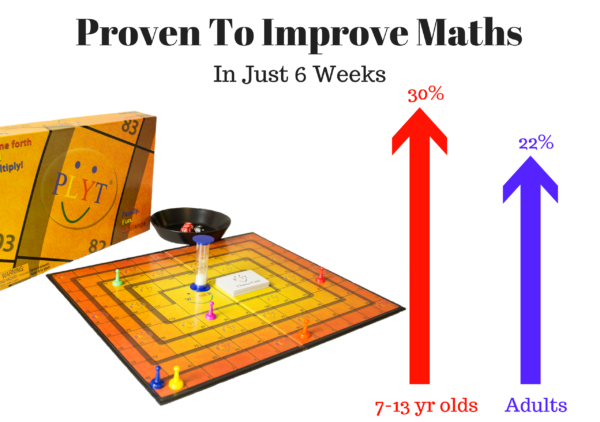 The children really enjoy the competitive element of the game and because they want to play, their maths is improving. It took us a little time to get to the right Standard but it’s very easy to play. Having teenage boys we find it difficult to get their attention and to find things that will get them sat still long enough to get their attention also to get them to do additional learning. PLYT game has done just that for us, this game is absolutely brilliant it is educational, challenging and all round great fun, this game can be made as easy or as difficult as you wish, it can be tailored for peoples different levels of ability so everyone can take part, we have found this game to be a great family game, we have had many of family fun evenings with it, we have found this game to help challenge the boys maths in a fun way, this game is for any ability, with this game it is very challenging and really makes you push yourself to get the correct answer and it gives you a real buzz when you get it correct, it really helps with the kids numeracy, it can be played as a family or with friends, the more you play the better and faster you become, my boys love this game and they ask to play it. 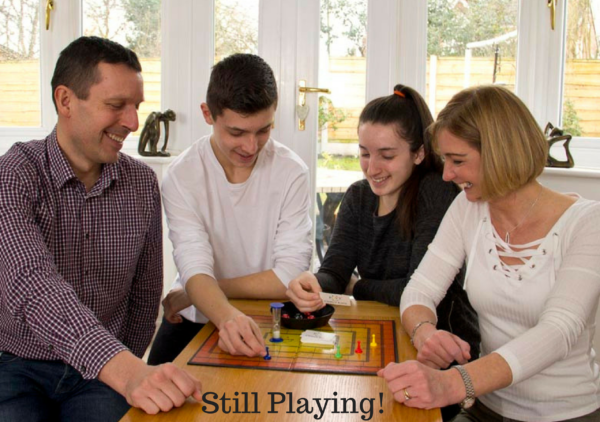 We thoroughly enjoyed playing PLYT together as a family, and given the way you can change the rules to suit the players I think this is the kind of game that will be a family favourite for years and years. Paul was the person for this game as he does all the maths with our boys. He liked this game, as you could play at different levels to suit each child and their ability which is great when playing with different age groups. Ethan our 10 year old enjoyed the game and George our 6 year old thought it was an excellent game and he was especially happy to win!! The game was created by parents for their own children, and we all really did enjoy playing it. It was nice to sit around an ‘old fashioned’ board game for a change rather than on the Nintendo Wii or on something computerised. 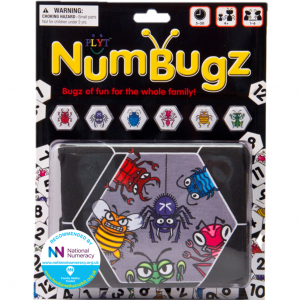 The game has a ‘logical’ looking board- no fancy graphics or cartoon characters, but it ‘does what it says on the tin!’ The dice are 12 sided so you get loads of number combinations and it is a fun way to boost a child’s numeracy confidence. I can see this would be a fabulous resource in schools to develop numeracy, the learning of times tables and the mental maths process in a fun way. I can imagine it would be a huge benefit in increasing recall speed and mental agility. I’m sure a child’s maths would improve through playing this game and school children would love to play a game during their maths’ lessons – what a treat! We would definitely recommend this game it was such fun. Nowadays when buying games it’s often easy to look for a game that looks good, but this game as simple as it is, was far more of an interesting game than others we have. My son has said he wants it on his Christmas list. Was lovely to see him choose a board game over the DS or Play station and it was lovely to have some time playing and learning together. Yes, the game is great. We tried it for the first time last night, and picked it up really easily – it’s a lot like Snakes and Ladders, with the Chance cards sending you all over the place. Luca liked it so much we had to play it again this morning, before school. My eldest two are 5 and 7 and it can be hard to find games that they both enjoy and can understand. It is quite common to find us bending the rules to accommodate the youngest or the eldest gets bored as the game is too easy. This was engaging and ticked all our boxes. I can see this being a great tool for teaching maths and would greatly improve everyone’s mental math agility, I found after just one game that I was finding better ways of working and checking my answers. I think we all enjoyed playing this game, it was great fun and I think the boy would play a game every day if he was given the chance. 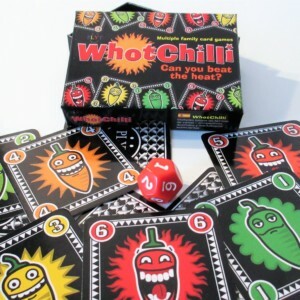 great game, simple to understand and fun to play!